Preservation and restoration of historical buildings pose a variety of interesting challenges. Terracon recently performed materials services during renovation and construction activities at the historic Union Station in Denver, Colo. The project revealed a time capsule of construction materials used during the 1800s and early 1900s. This would prove to be a challenge in testing construction materials that were more than 130 years old. The original Union Station opened to the public in 1881 to service the transportation needs of several railroads in the western United States. The main structure was rebuilt in 1912 and still stands today. A major renovation of Union Station has been active since January of 2013 and will be finished in the summer of 2014. When complete, the station will be a central transportation hub for Denver and will include light rail, commuter rail, train, taxi, bus, and pedestrian activity. The newly renovated building will also feature retail stores, restaurants, and a new luxury hotel with 110 rooms. When something new is built on something old, integrity of construction materials is important to public safety, building codes, and the extended life of the structure. No matter what the age of the building, Terracon’s materials services verify that the overall foundation and elements of a structure are sound for renovation and new construction activities. Depending on when and where your building was constructed, you need a local consultant with the familiarity and capacity to evaluate a variety of different construction materials. The materials sampled and tested by Terracon at Union Station included rough sawn timbers, clay brick and cut stone foundation elements, cast iron columns and steel beams, and terracotta masonry units. During the materials evaluation process, Terracon worked closely with the project’s structural engineer and general contractor while evaluating the material properties of existing construction materials. Many of the materials tested by Terracon are not commonly used today, and evaluation of the materials’ properties was key in preserving much of the historic original construction materials in the final project design, while also satisfying present building code requirements. Wood timbers were used in the building attic and roof framing members. For the materials evaluation, Terracon collected samples of the timbers from various locations throughout the upper level framing, and prepared the samples for testing in accordance with ASTM standards. Terracon evaluated several properties related to strength and integrity that included axial compression parallel to the grain, compression perpendicular to the grain, static bending, and testing for moisture content and specific gravity. Based on these test results, the project’s structural engineer was able to establish the appropriate allowable load for the timbers in the final building design. foundation materials for the determination of the splitting tensile strength of the rock. The material properties were used by the design team in evaluating the bearing capacity of the building foundation and satisfying the local building department requirements. Clay brick was used for load bearing walls of the building. In-situ measurement of the masonry mortar joint shear strength was determined in accordance with ASTM standards in order to evaluate the structural integrity of the original masonry construction. Many of the original clay brick walls are preserved within the building renovation. Cast iron columns were used to support the primary structural steel beams at the street level of the building. Terracon conducted ultrasonic testing of representative columns to determine their material thickness in order for the design team to evaluate the column capacity. Cast iron material thickness in excess of 1.5 inches was determined for the larger columns examined. Material samples were obtained from several existing steel beams within the floor framing of the building for the determination of tensile properties including yield strength, ultimate strength, elongation, reduction of area, and modulus of elasticity. The material properties were used by the design team to evaluate the load capacity of the existing steel beams and the required remedial construction for the building renovation. Because many of the materials tested at Union Station are not commonly used today, a local knowledge of older building styles and construction strategies was essential to the success of this project. 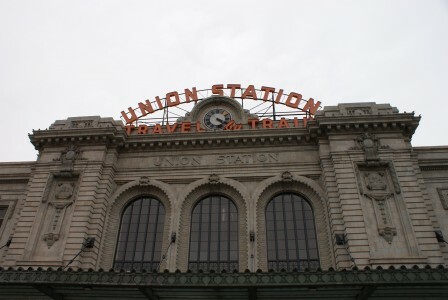 Fortunately for the client, Terracon’s project manager had worked on several projects in the same neighborhood and throughout downtown Denver, giving him a familiarity with building materials and construction approaches utilized during the same time period as Union Station construction. Terracon also had the capacity to test a majority of the materials in-house and for those materials that we could not test, we had a relationship established with a teaming partner that could accomplish the task. Terracon’s past experience on similar projects, current testing capabilities, and established relationships laid the groundwork for the Union Station Project. Terracon pulled all of these elements together and delivered success to the client and our project team.